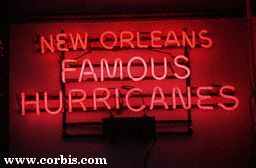 hurricanes in Louisiana, please visit the National Weather Service webisite. 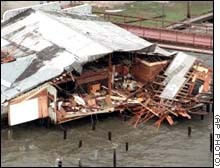 Pictured is Brunings Restaurant on Septmber 29, 1998-the day after Hurricane Georges. To view current weather conditions at the Lakefront Airport click on the rainbow. Go to September 28, 1998 for conditions during Hurricane Georges. Notice that on the 29th no data is available. That's because the hurricane knocked out power to the weather station. In late August of 2005 Hurricane Katrina washed away all but one remaining camp in Little Woods.